Philip James wants you to have another glass of that '06 Bordeaux. So much so that he has launched an invite-only website dedicated to giving members insider access to a curated selection of sought-after wines. Since November 2010, James and business partner Kevin Fortuna have been gaining the attention of oenophiles and investors alike with Lot18, the flash-sale site they run from New York City. "We work with small, family-owned wineries who make great products but don't necessarily know how to market them," James says. "So we find a case of their wine and bring it to a national audience." After earning his MBA from Columbia University and pioneering several tech companies (including the massive wine database Snooth.com), James sniffed a huge opportunity in online wine sales. 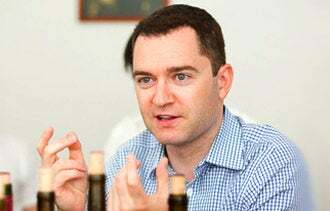 He and Fortuna ran into initial resistance from investors; there has been a black cloud over the industry since the late '90s, when loads of cash were dumped into web wine projects with little return. "Every single time we'd speak to a VC, they'd say, 'Yeah, but wine is a bad business,'" James says. "We decided to attack the glaring problem head-on and say, 'We get it, wine on the internet is a graveyard of lost and broken dreams. Now here's why we're different.'" The tactic paid off. The founders have raised $45 million in venture capital from Accel Partners, NEA and FirstMark Capital. We caught James between tastings to find out just how he built his mini empire. Why is it a good time for a private-sale wine site? Demand. The massive wine industry really hadn't been organized online like books, movies and so many other industries. On the supply side, wineries need this. Everyone in these winemakers' hometowns loves their wine, but they don't ship it to, say, New York. On the consumer side, there was a desire for access to better wines at a reasonable price point. People really want the sommelier experience, and we have tons of educational content on the site that talks about the wine and tells the story behind it. Also, the laws on how wineries can ship across state lines were recently loosened. What accounts for your growth? We're adding more than 1,000 members a day. We have about 750,000 registered users, and we work with more than 500 vendors. The largest source of new users has always been members referring members. We put a lot of effort into promoting member referrals. If you sign someone up who places an order, you'll get a credit on your account. By March of last year we were doing $1 million a month in transactions on the site, and we take a cut of everything we sell. The fee we get varies depending on the product, price, vendor and other variables. What innovations do you bring to the table? Traditionally, shopping for wine online is a difficult process. Part of the beauty of what we do for the consumer is to make the whole experience really simple. You tell us where you live and we'll figure out which wines we can get to you legally. That's an incredibly complicated infrastructure of state regulations. On the logistics side, we want to make sure you get your product quickly and that it's not damaged. We work with companies who send out air-conditioned trucks. If you don't have scale, these things are very expensive to provide. What's been your greatest challenge? Maintaining our company culture given how quickly we've hired. We launched with six people; we now we have 100 spread across four offices in New York, California, France and the U.K. Trying to make sure everyone knows the goals and values of the company, given our rate of hiring, has proved difficult. We have a program we call Wine Fridays, where someone gives a presentation, we order in food and enjoy some wine. It's a great chance to bring in people we're interviewing or for partners and friends of the company to get to know each other. We spend a lot of time setting company goals and crafting our mission statement and brand guidelines. I know exactly what it feels like to be anxious to dive in. We bootstrapped at the beginning, put things on my credit card, worked nights and weekends. We tried to grow Lot18 while maintaining our current jobs. I would have hung on to my previous job even longer if I'd known what I know now.